Many companies yet not explored the capabilities of x86 virtualization. For more than ten years, x86 virtualization is on the priority list of IT managers. More than three quarters of all the companies would take advantage of virtualization techniques to the end of 2013, six out of ten workloads are then already in virtual machines (VMs). The market for hypervisor has matured, the consolidated benefits of virtualization is undisputed. Most companies have already moved the simple IT applications to virtual servers. Looking to the year 2013, still there are remaining complex, business-critical applications, especially high-performance databases, ERP and collaboration systems. Such applications just save the hardware costs by virtualization. According to the analysts, the aim must be to make these systems mobile, so that they can be moved easily, protected and allow duplication. The role of the IT infrastructure manager is becoming to determine whether virtualization can make applications faster, safer and more reliable. In the second step it is necessary to prove these statements are concrete. If your virtual machine is truly mobile or your virtualization scenario rather than static, they will give more return of investment. They point to the many features in the context of the hypervisor resource management. These allow some to move the VMs automatically or to optimize the utilization of host systems and their performance. For example, IT managers should regularly check consolidation ratios and check the sizes of the virtual machines. Appropriate tools are available and perhaps even partially installed within the company. 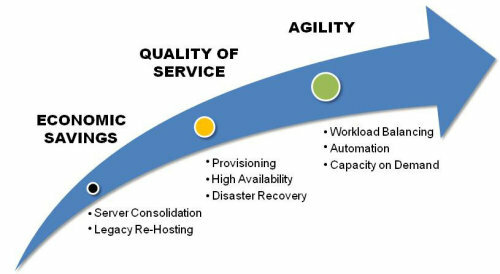 From the perspective of the user, companies the main reasons for accepting virtualization today are – higher reliability and improvements in terms of disaster recovery . This at least has shown a recent survey. Already there is a growing market for backup, recovery, snapshots, replication and archiving techniques for data in virtual machines. After 2013 will be more use of data protection and disaster recovery tools that are specifically designed for virtualization management systems and they will be integrated with. The return of investment (ROI) for virtualization projects are increasingly determined by an improved reliability of the IT infrastructure. Both VMware and Microsoft have consolidated their suites for the virtualization management and now offer simple packages. These mainly include monitoring and analysis capabilities, also features the capacity for planning, configuration, performance management and automation. For example, Dell has bought the IT management software providers that developed among other things than raw virtualization and cloud management tools. This is an issue of over burdened by data. This Big Data is a problem where the help of analytics tools can help. In this way. often the hidden treasures are in increase, the companies could foster greater efficiency in IT. This Article Has Been Shared 4252 Times! Cite this article as: Abhishek Ghosh, "Virtualization : Draw the Potential Out of It," in The Customize Windows, September 2, 2013, April 26, 2019, https://thecustomizewindows.com/2013/09/virtualization-draw-the-potential-out-of-it/.